For 30 years Professor George E. Mylonas directed excavations at Mycenae for Washington University in St. Louis and the Archaeological Society of Athens. Mycenae is famous as the seat of a royal family that controlled much of the northeastern Peloponnese by the end of the Middle Helladic Period. The citadel of the site was first fortified in the 14th century BC. and the strengthened defensive wall was decorated with the famous Lion Gate during the 13th century. An earthquake near the end of the 13th century devastated the palace. In 1951 and 1952, Professor Mylonas led the excavation of Grave Circle Band demonstrated that it pre-dates Grave Circle A discovered by Heinrich Schliemann in 1876. 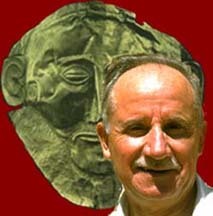 Professor Mylonas directed excavations both inside the citadel and outside in the years following 1957. He investigated ruined houses near the Treasury of Atreus, ruins along the northwest and east slopes within the citadel, the area around Tsountas' House, and four Late Helladic IIIc chamber tombs at Gortsoulia (2 kilometers northeast of Mycenae). An altar and various Late Helladic IIIb cult objects were discovered in the area near Tountas' House. Grave Circle B contained 25 burials of which 14 were shaft graves and the remainder were cist and trench-like graves. Pottery found around and inside the grave circle belong to the gray, black, yellow Minyan and matt-painted wares associated with the Middle Helladic III Period; the latest burials in the grave circle may belong to the Late Helladic I period. Large, decorated jars were placed at the head and feet of several burials. Some of the large jars are interpreted as oil containers while others may have contained flour, honey, and wine. Jugs, goblets and drinking cups were placed as kterismata ("grave offerings") for the dead. Burials inside Grave Circle B included 15 adult males, 6 adult females, 2 sub-adult boys, and 2 sub-adult girls. Grave Gamma, one of the largest, measured 3.2 x 1.8 meters and extended to a depth of 3.5 meters. Three articulated burials were found on the floor of the grave while a fourth, earlier burial had been pushed against the sidewall. Two articulated male burials were discovered side-by-side and parallel to the long axis of the grave. An articulated burial of a woman was placed across the width of the tomb and at the feet of the articulated male burials. The kterismata included a mask of electrum, two gold cups, swords, knives, and 37 pottery vessels (including the large, painted vase held by Dr. Betty Grossman and Kasta Papademetriou). Mylonas posited that Grave Xi belonged to a Mycenaean princess (estimated as 5 or 6 years old when she died). She was buried with ten jars, stemmed goblets, jugs, and a painted amphora. A golden diadem was found upon her head and around her neck was a necklace made of rock crystal beads and a bluish faience bead. Loops of beads and coiled gold bands were found next to her skull; they had been used to keep her hair in place. She was buried with simple earrings, a ring of coiled gold wire around the little finger of the left hand, and a hollow, nut shaped, golden artifact that was probably a favorite toy. Schliemann discovered the burials of 9 adult males, 8 adult females, and 2 sub-adults inside Grave Circle A. The burials in Grave Circle A are dated to 16th century BC while the burials in Grave Circle B are dated to the late 17th century BC. 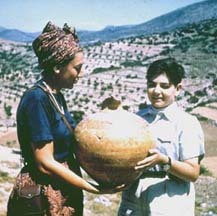 The photographs of Mycenae and Dr. Mylonas were taken by Mr. Edwin Grossman during the 1950s. They may not be reproduced without written permission from the St. Louis Society of the AIA. 1966 Mycenae and the Mycenaean Age. Princeton University Press. 1972 Grave Circle B of Mycenae. Athens [in Greek]. 1983 Mycenae Rich in Gold. Ekdotike Athenon S.A., Athens.